Fun Exercise Facts: How Do We Compare to Animals? Home > Fit Families > Fun Exercise Facts: How Do We Compare to Animals? Every year, humans break new sporting records, going higher, faster, deeper or longer. However thoroughly these records are broken, animals will always manage to beat them. Animals that run fast, such as cheetahs, tend to be small and lean, and very streamlined. They have larger hearts and lungs than other animals, to increase the oxygen moving through their bodies. Its flexible spine and special leg muscles give the cheetah a huge stride, allowing it to cover a long distance in a single step. The cheetah can only keep up very high speeds for short periods before it needs to rest. A cheetah can run at about 70 to 75 miles per hour, with maximum speeds over short distances of up to 125 miles an hour. The pronghorn, which is similar to an antelope and lives in North America, can run at 61 miles an hour. 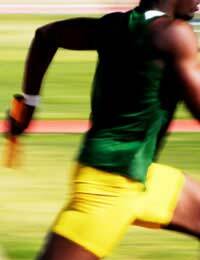 Over a short distance, a human can run at about 27.8 miles an hour (and a snail moves at about 0.03 miles an hour). Animals that jump will usually have long legs, large leg muscles, and bigger feet and ankles, which might have extra bones or joints. Javier Sotomayor from Cuba holds the world record high jump; he jumped 2.45 metres in July 1993. A flea can jump about 130 times its height – that would be the same as a 1.7-metre tall person jumping 221 metres, which is 32 metres higher than the BT Tower. Mike Powell from the USA holds the world record long jump; he jumped 8.95 metres in August 1991. A frog can jump 20 times its body length, which is about the same as a man jumping around 30 metres. Animals and birds can dive for long periods because they can store more oxygen in their bodies than other animals and birds. The heart rates of diving animals and birds slow down when they are under water, which cuts down the amount of oxygen they need. Diving animals and birds can also survive with less oxygen in their blood. Stéphane Mifsud holds the world record for breath holding underwater (without breathing extra oxygen beforehand); he held his breath for 11 minutes 35 seconds in June 2009. Under the Guinness Book of Records rules, competitors can breathe pure oxygen for ten minutes before breath holding – under these conditions, Peter Colat held his breath for 19 minutes 21 seconds in February 2010. Emperor penguins can dive for 30 minutes without taking a breath, and elephant seals can dive for about two hours without breathing. William Trubridge holds the world record for free diving, not using any weights or fins; he dived to 88 metres in April 2009. Using weights and other aids, Herbert Nitsch dived to 214 metres in June 2007. Emperor penguins can dive to 460 metres or more, and elephant seals can dive to around 1500 metres (1.5 kilometres). Sperm whales may be able to dive even deeper, to about 1800 metres (1.8 kilometres).